Tsukisamu park was historically used as a small training ground for the 25th Infantry Regiment and used to be called ‘Kanjodai’ during the end of the Meiji era. The park itself was opened in 1961. Nowadays, along with the natural forest which retains its gentle hills, the wide area of the park contains sporting facilities such as baseball fields, tennis courts and a park golf course (available to use after paying a fee), along with lots of multi-use free space and playgrounds. Both children and adults can enjoy the facilities at this park. You can enjoy the view of the landscape of the Mizono area from the top of the hill, and the wide open space spanning from the sides of the hill can be used freely for a variety of activities. The park life center looks out over this open space and is used as a rest area and as a center for various activities. Tsukisamu Shrine is located to the west of the park. The area around the shrine contains very old trees and historic stone moments where you can enjoy a quiet stroll while admiring the history and greenery of Tsukisamu park. 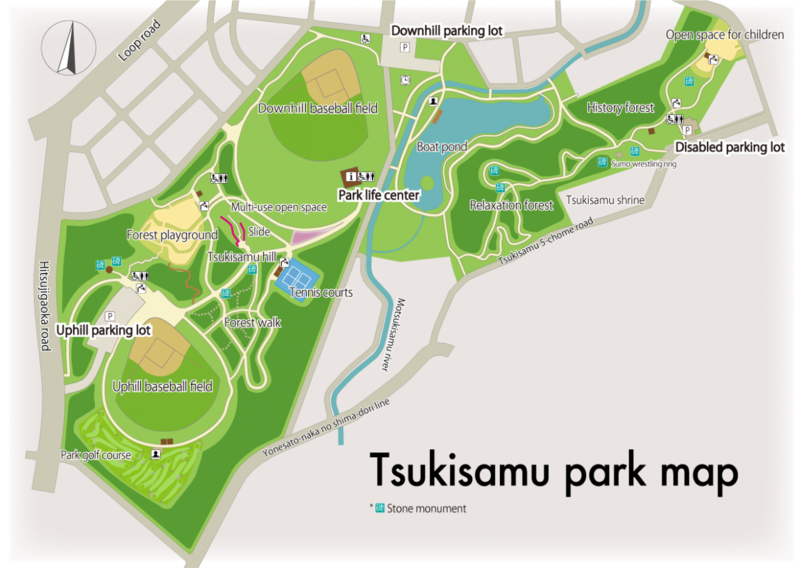 Since it has been fifty years since Tsukisamu park has opened, the park had been undergoing various maintenance and construction works with the aim of improving the facilities within the park to comply with universal design standards and to make them more suitable for use as safety evacuation areas since 2012. The works are scheduled to be completed in 2018. The forest playground is an area where children are free to play inside the forest. There are lots of exciting play facilities such as playground equipment and a Tarzan rope swing for children to enjoy. You will find many children having fun here on weekends and holidays. On Tsukisamu hill you will find the longest slide in Sapporo which uses the slope of the hill to create the slide and is very popular with children. You can experience the changing seasons at the boat pond with it being surrounded by fresh greenery and drooping cherry blossoms in spring, hydrangeas in early summer and the color-changing leaves in autumn. You will also often find wild birds such as mallard ducks, tufted ducks and herons visiting the pond. Located in an area overlooking the free open space area of the park, the park life center was opened April 2017. The center is an indoor facility which is used as a rest area, a hub for various activities, and also houses the park administration office. The center contains a rest area, kiosk, baby-feeding room, and a kids area. The center becomes very lively during weekends and holidays when lots of people come to enjoy arts and crafts events that the center holds. The park contains baseball fields, tennis courts, and a park golf course that are available to use for a fee. There are two baseball fields within the park: a large one surrounded by a row of larch tree on top of a hill, and one located downhill equiped with lighting making it suitable for night matches. Both of these fields are very popular for baseball matches. There are two Omnicourt tennis courts that are well equiped with lighting for night games. These courts are soft on your feet and hips and have good water drainage. The park golf course has 18 holes, and despite being rather compact at 697m has multiple difficulty levels which both beginners and experienced players can enjoy. 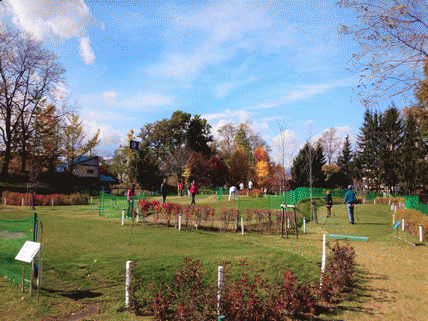 This course is well-loved by the locals and is the place where the Toyohira ward competition in held. Copyright (C) 月寒公園 All Rights Reserved.